New York State, with funding from the FEMA, is providing disaster case management (DCM) services for New Yorkers with unmet needs arising from Hurricane Sandy. Catholic Charities Community Services, Archdiocese of New York is managing the DCM program, as it did following Hurricanes Irene and Lee. 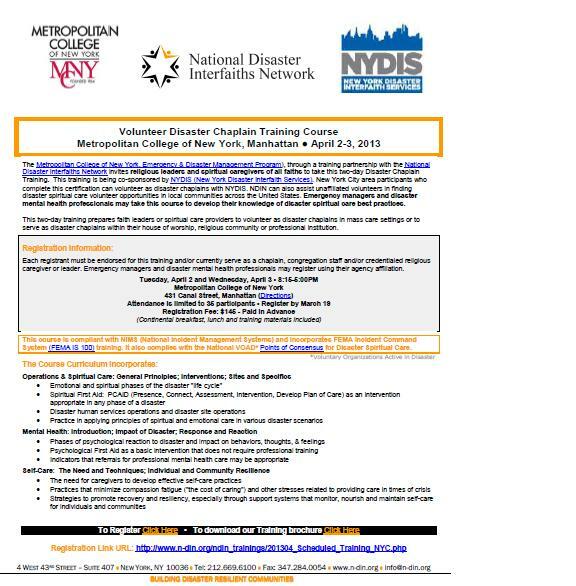 The DCM program is designed to provide a locally-based disaster case manager for New Yorkers with unmet needs related to Hurricane Sandy. By funding a coordinated network of community-based agencies, New York State hopes to provide easy access to support for residents seeking help and to avoid duplication of services. Catholic Charities is subcontracting with locally-based not-for-profits to provide direct services through October 2014 in the following counties: Bronx, Kings, Nassau, New York, Orange, Putnam, Queens, Richmond, Rockland, Suffolk, Sullivan, Ulster, and Westchester. In order to be eligible for the DCM program, a person must have an unmet need that arose from or was exacerbated by Hurricane Sandy. Those that are ineligible for FEMA or other assistance programs are still eligible for the DCM program as long as they have a verifiable unmet need related to the storm. Through 211/311, the Catholic Charities SANDY Helpline (855-258-0483), or directly through DCM agencies. 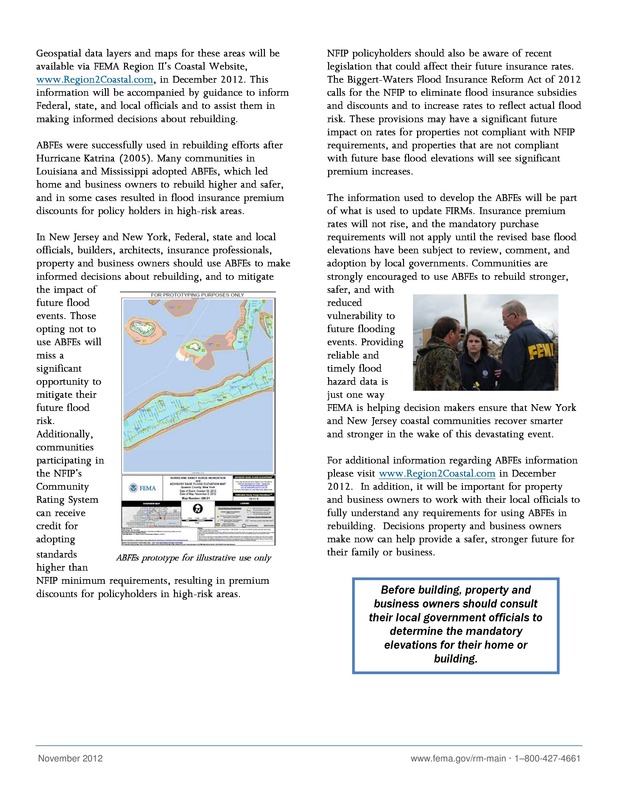 FEMA has released its Advisory Base Flood Elevation (ABFE) information to help communities plan for and reduce the risk from future flooding. FEMA Region II (covering NY, NJ, Puerto Rico, and the Virgin Islands) has initiated a coastal flood study to update Flood Insurance Rate Maps (FIRMS) for parts of NY and NJ. The website www.region2coastal.com, which hosts a wide array of information, will be updated as the Region II coastal flood study continues. This information is crucial to those who need to rebuild after Sandy so they can build stronger and safer. It is important for property and business owners to work with their local officials to fully understand any requirements for using ABFEs and/or determining mandatory elevations in rebuilding. On the Sandy ABFE page www.region2coastal.com/sandy/abfe, you can view interactive ABFE maps, watch video tutorials, and access guides and toolkits. Here is a sample of some of the information available. 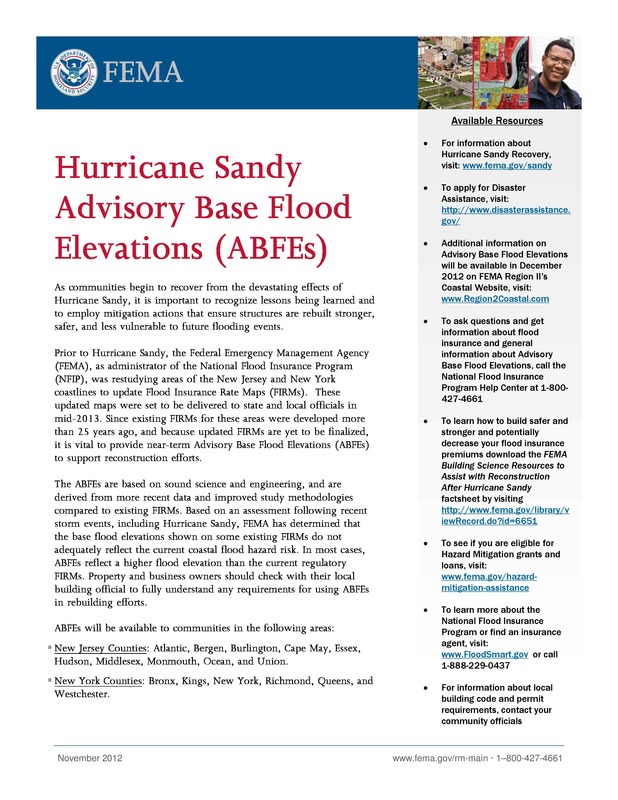 Anyone with questions or comments about ABFEs can call the National Flood Insurance Program (NFIP) Help Center at 1-800-427-4661 or fill out the online form at http://www.region2coastal.com/contacts. Please take the time to explore this website and share this information with your staff, clients, and networks. 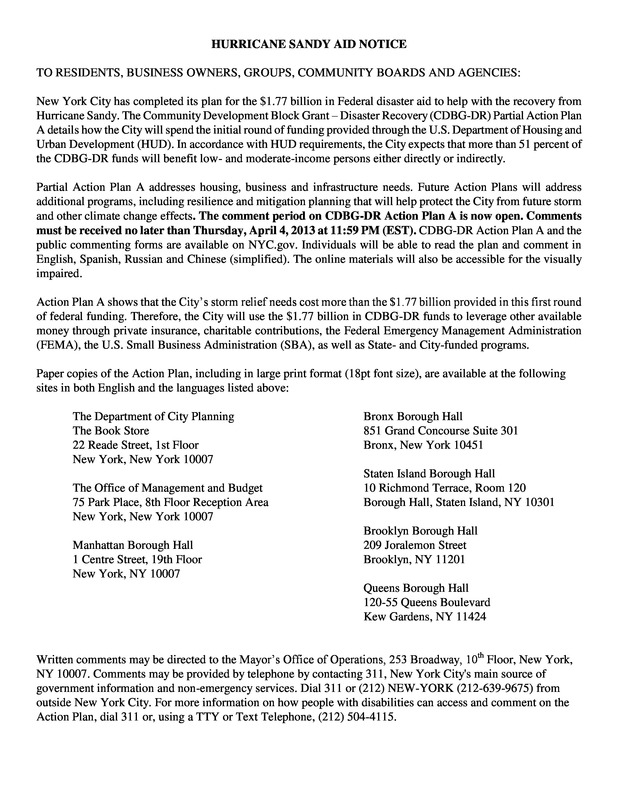 Below is the link to the NYC’s Community Development Block Grant/Disaster Recovery/Partial Action Plan-A. This is the City’s plan for the $1.2 billion released by the Federal Government towards recovery and resiliency that will address housing, business and infrastructure issues. Released on March 22nd, the public has 14 days (deadline: April 4, 2013) to comment. Brooklyn Borough Hall is listed as one of many sites citywide to view this document. 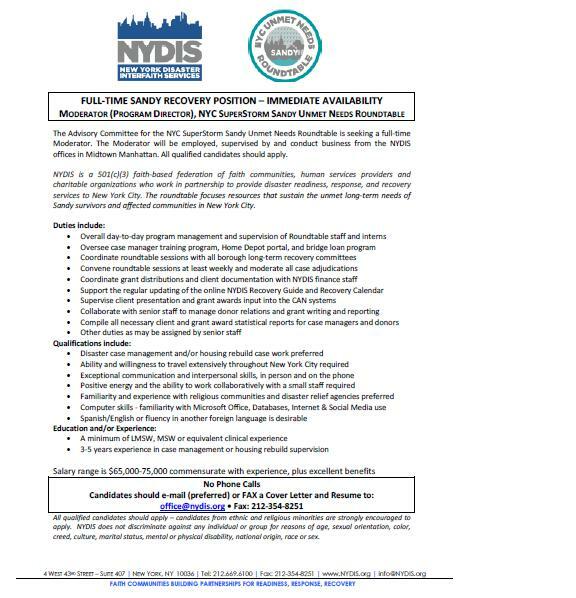 For all citywide locations please review the document below. Comments are to be made online or for more information on how people with disabilities can access and comment on Action Plan A, dial 311 or, use a TTY or Text Telephone, (212) 504-4115.